Following two years at Cerritos Junior College in California, Camarillo transferred to the Univ. of Washington and averaged 39.3 yards on 115 punts in 1979 and ’80. He joined the New England Patriots as an undrafted free agent in 1981 and spent seven seasons with them. Camarillo proved to be an excellent directional punter with good hang time. He received second-team All-NFL recognition from NEA in 1982 and was a consensus first-team All-NFL choice in ’83, when he was also chosen to the Pro Bowl. Camarillo was released by the Patriots following the 1988 season, having punted 468 times for a 42.6-yard average. He spent ’89 with the Rams where his average dropped to a career-low 39.5 yards over the course of nine games, after which he was again released. Camarillo signed with the Cardinals as a free agent for 1989. Cardinals went 5-11 to finish fourth in the NFC East. 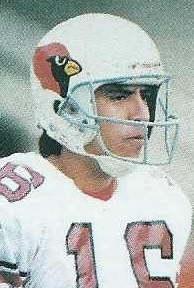 Camarillo’s excellent 1989 season, in which he put 21 punts inside the 20 with only six touchbacks, was the first of five with the Cardinals, which were his best. He was a Pro Bowl selection after three consecutive seasons, when he was also a first-team All-NFC choice of Pro Football Weekly and UPI, and received consensus first-team All-NFL recognition in 1992. Camarillo had a career-high 45.3 average in ’91 and, moving on to the Houston Oilers in 1994, set a then-league record with 35 punts inside the 20 (along with Pittsburgh’s Mark Royals). He spent one more year with the Oilers in ’95, which effectively concluded his NFL career although he was active for one game with the Raiders in 1996 but added nothing to his punting statistics. Overall, over the course of 16 seasons, Camarillo averaged 42.7 yards on 1027 punts, with 346 punts for a 43.7-yard average coming with the Cards. He received consensus first-team All-NFL honors twice, first- or second-team all-conference recognition after four other seasons, and was chosen to five Pro Bowls.